A jewel in the crown of any border or rockery. Wonderful bright purple-red puffs of flower on neat mounds of green foliage. Height 20cm. Whether in borders or patio containers, they will delight you with their stunning shapes and colours. 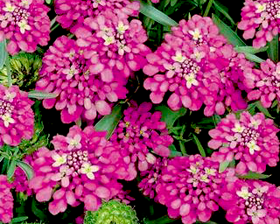 Sow iberis seeds in spring outdoors where they are to flower. Sow 3mm deep in rows 30cm apart. Germination usually takes approximately 21 days. Seed can also be sown outdoors in early autumn for over-wintering and earlier flowering. They prefer a sunny open site and well drained soil, but will grow in most sites and soils.